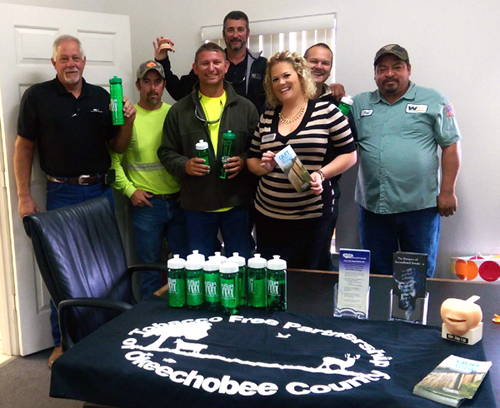 On Friday November 21st the Tobacco Free Partnership of Okeechobee partnered with Waste Management employees to celebrate the Great American Smoke Out, which encourages smokers to quit or to use the day to make a quit plan. Jason Johns, James Beville, Allen Leitner and Jaen Torres. If you're a smoker, quitting is the single most important step you can take to protect your health and the health of your loved ones. Smoking causes immediate damage to your body, and it threatens your future with increased risks for cancer, heart attack, lung disease, and early death. Many people have probably urged you to quit smoking already, but we all know that quitting can be hard. Quitting smoking can be hard, so Waste Management employees were given a plan to help smoking employees get past symptoms of withdrawal. Below are five steps that can help anyone who is trying to stop smoking. Set a quit date. One you make the commitment to quit, a firm quit day within the next 2 weeks. Tell your family and friends you plan to quit. Share your quit date with the important people in your life and ask for support. A daily e-mail, text message, or phone call can help you stay on course and provide moral support. Plan a smoke-free lunch date or game night to distract yourself. Or gather your family in the kitchen to cook a special meal together. Remove cigarettes and other tobacco from your home, car, and workplace. Throw away your cigarettes, matches, lighters, and ashtrays. Clean and freshen your car, home, and workplace. Old cigarette odors can cause cravings. Tobacco Free Florida offers a number of free resources to help smokers quit. For more information contact 1-877-U-Can-Now and you will receive proactive coaching sessions, self-help material and free nicotine replacement therapy (to eligible callers while supplies last.) Nicotine patches, gum, or other approved quit medicines may help with cravings. For additional resources, contact Courtney Moyett, Tobacco Prevention Specialist in Okeechobee County, at cmoyett@quitdoc.com.